Having gorgeous natural waves is every fashioniser’s dream, especially of those, who have sleek, straight hair that sometimes is really hard to curl. This hairstyle has always been the most anticipated style for all women of all times, as it adds volume and perfection to their looks. It seems like waves do not get out of fashion at all, since they are appropriate for any kind of occasion, be it an ordinary cocktail party, annual ceremony, wedding or even for everyday look. There are different ways to reach a perfect wavy look using any of hairstyling tools like hot rollers, irons, and then fixing with spray for a longer duration. The task however is somewhat difficult and much time consuming for straight hair especially. There are some hair types that no matter what you do, they seem to become loose at once. However, it is commonly known that loose waves are even more elegant and sexier. Nevertheless if you want to learn how to style natural waves, without damaging your precious hair, then have a look at the tips presented below. First of all you should consider a few small details before trying to create waves naturally. Your hair should have a proper cut, especially if your hair is heavy and thin. All of us know that heavy hair is difficult to carry the waves on, and thin hair, on its behalf gets flat easily. So refresh your look by having a haircut, you can have some layers that will make the hair easy to work on. Secondly wash your hair and use conditioner that is for your hair type. Dry your hair with a towel with slight movements not to break the hair. Once the hair gets rid of wet drops, comb your hair with a wide-tooth comb. Then take either styling mousse or gel and apply to your hair. Use the products for the tips only, without touching the roots not to make them itchy. And divide your hair into several sections, thus making it easy to work on small parts of it thoroughly. Start working with your fingers. By taking the small section of the hair, roll or wind the latter on your finger and fix it with clips. Repeat the same action with all the sections of hair. And let the hair dry this way. After several hours, when the hair is completely dry, take the clips away and enjoy your natural waves! For this means, you will have to repeat the same action: washing, conditioning and drying your hair with a towel. 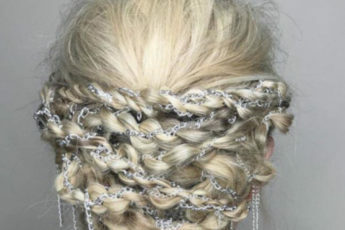 Next make a tight braid of the hair and let it remain so overnight. Depending on what waves you want to get, either braid the entire hair tight or have several braids. Keep in mind that the larger braid you have the looser your hair will be. Once you complete braiding, fix the hair with a band and go to sleep. Take the bands away next morning and give a final touch to the hair either correcting the waves with fingers, or if you are afraid the hair will not last long, then apply hairspray. If, on the contrary, you see that the hair has much volume, work with it with wet hands to smooth it a little bit. If you want to have loose waves then this method is for you. Simply wash, condition and dry your hair. After combing it, make a top bun by twisting your hair around itself. And fix it with a band. Again you can either let your hair remain so overnight, or if you have to go somewhere that exact day, wait for a couple hours and then take the band away. Since the entire hair was twisted together, in order to separate the waves from each other comb your hair with your fingers. You will have loose waves that look more natural than any other waves made by hairstyling tools. For hair that have tendency to straighten, use hairspray. You have short hair and think waves are not for you? Don’t you worry! You can have even a sexier look with waves you haven’t even dreamed about. You will need lots of styling gel and mouse to achieve the fantastic look. Apply the gel onto your hair and start waving your hair with the help of a comb and fix your waves with clips. Or you can wind the hair on a pen, and then secure the wave with clips. Let the gel do its job and take the clips away a short time after. Enjoy your natural waves. Use these easy hair tips, add fantasy and work with fingers and you will have natural waves for every occasion. Give a break to those hairstyling tools that damage your hair. Let your hair relax, yet look perfect and natural, with the use of minimum efforts, but reaching maximum effects.